A long-gone pioneer of Richmond brewing is making a comeback. 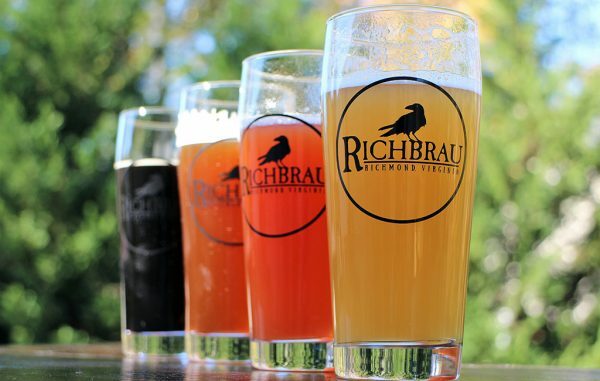 Richbrau, a local brewery brand that operated at 1214 E. Cary St. in Shockoe Slip before closing and filing for bankruptcy in February 2010, is making its return to the region with new brews and a new ownership group. The effort is led by Matthew Mullett, a commercial real estate broker with Richmond-based Dodson Commercial, who with a group of investors secured the trademark to Richbrau last year. “Richbrau is a brand that has deep roots in our city’s brewing history and deserves to be part of the world class craft beer scene being built here,” said Mullett. The group is mulling potential locations for the revived brewery, four sites ranging from 3,000 to 6,000 square feet in the Shockoe Bottom or Shockoe Slip areas, Mullett said. Site selection should occur by the first quarter 2018. Plans call for the first keg of new Richbrau beer to be tapped for the public by fall 2018, Mullett said. Once operational, it will become the region’s 33rd brewery. Prior to working in commercial real estate, Mullett spent 15 years in the brewing industry, including 11 years as a distribution manager with MillerCoors. Representing brewery and cidery clients as a broker, Mullett was aware of the difficult task breweries faced in successfully trademarking brand and company names. That experience conjured the memory of Richbrau. That path culminated in an hour-long phone call with the U.S. Patent and Trademark Office, during which it was determined all rights to the Richbrau name were available for use since 2013. Mullett snatched up the brand in July 2016. The acquisition comes with a history that extends well beyond Richbrau’s most recent life as a brewpub in the Slip. 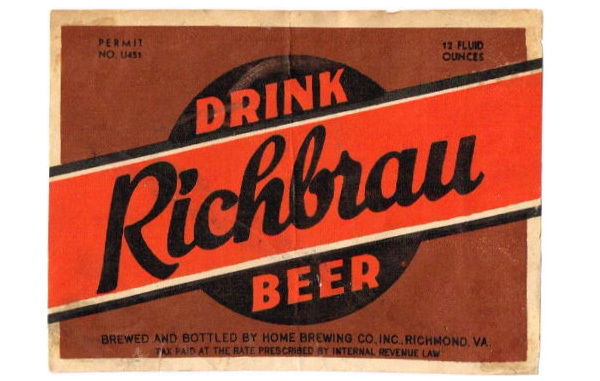 Its history in Richmond can be traced as far back as 1933, when at the end of Prohibition, Home Brewing Co., the original brewers of Richbrau, switched back to bottling beer over soft drinks such as “Tru-Ade” and “Climax” sodas. Richbrau would then experience nearly three decades of continued growth, until post-Prohibition-era competition from the likes of Schlitz and Schmitz took a toll on Home Brewing Co., forcing the company to end its brewing operations in the city in 1969. That was the end to Richbrau’s run in Richmond, until the 1990s, when businessman Michael T. Byrne created Richbrau Brewing Co. The company ran the brewpub out of four connected buildings that took up nearly 40,000 square feet in the 1200 block of East Cary Street. The business closed in February 2010 after 17 years, eventually filing Chapter 7 bankruptcy. Mullett, who said his new venture does not involve the previous proprietors of Richbrau, envisions the brand’s third incarnation evolving in three key phases. Phase two would involve expanding into a larger facility, likely 25,000 to 35,000 square feet with an initial capacity of 20,000 barrels. Phase three would involve signing distribution agreements to have Richbrau spread throughout the state and increase its brewing capacity to more than 60,000 barrels. To get the beers flowing, Richbrau has hired Brian McCauley as its head brewer. Drawing from his biology and chemistry background, McCauley, a Portsmouth native and James Madison University alum, said he has been brewing craft beers since 2013 while working full-time as a physician’s assistant. Since Mullett’s group secured the Richbrau trademark, McCauley has been busy crafting seven beers, a blend of IPAs, stouts and sour ales. “When we open, we plan to have six tap lines with a few of the lines rotating frequently,” McCauley said. Each of the beers will be named for a historic event that occurred in Richmond or local urban folklore. Richbrau’s sour ale, Vampire, is a reference to the claim that the mausoleum of W. W. Pool in Hollywood Cemetery holds the remains of a vampire. Food will also be on the menu. Henry “Hank” Schmidt III has been hired as Richbrau’s operations manager. He will handle day-to-day brewing operations in McCauley’s absence, customer engagement and taproom operations. Schmidt III joins Richbrau after two years with Flying Bison Brewing Co. in Buffalo, New York, Mullett said. He also spent time working in Germany learning various German beer purity traditions. Mullett would not disclose how much is being invested to revive Richbrau, nor would he identify his investors. The third incarnation could be a charm for Mullett and McCauley given Richmond’s maturing booze scene, which has changed dramatically since Richbrau was last poured here. The region is home to more than two dozen breweries, cideries and distilleries. And state laws have loosened to help make beer and spirits distribution and tastings easier for booze-making operations. But stiff competition has prompted some brewers to say the market is becoming saturated – forcing several to pull out all the stops with improved taprooms, and expanding distribution networks both domestically and overseas. According to state commerce data, brewery licenses have increased 468 percent since 2012, when the General Assembly passed SB604, which allowed breweries to have tasting rooms. Mullett admits competition is out there, but said there is still room for new players in Richmond. He pointed to more mature markets such as New Haven, Connecticut and Washington, D.C., where he said craft beers have between 25 and 30 percent of the market. 5 Comments on "Richbrau revival: Long-gone brewery pioneer makes a comeback"
At some point the law of supply and demand will kick in for all these breweries. Brings back great memories from high school. A six pack of Richbrau and a pack of Domino cigarettes cost a total of about 75 cents. Raise your hand if you ever choked down a Richbrau “Big Nasty” back in the day. Richbrau tasted like a wet dog smells, I drank plenty of them. The Big Nasty was a Christmas tradition for us. My son in law and I would drive downtown and pick up several to enjoy while my daughter and he were visiting. We have since picked other Christmas beers to continue the tradition. But definitely some good memories of the “Big Nasty”.